is a vibrant, Christ-centered community whose primary purpose is to celebrate the sacred liturgy and the Sacraments. Empowered by the Sacraments, we are called to personal holiness, to spread the word of God, and to actions of generosity and compassion toward all of God's people. We aspire, through prayer and action, to further God's kingdom on earth. Our Mission: To provide a Christ-centered, child-focused learning environment where Catholic ideals and a tradition of excellence are instilled. City- St. Joseph to receive the Blue Ribbon School of Excellence Award. love, while continually renewing and "recreating the face of the earth." 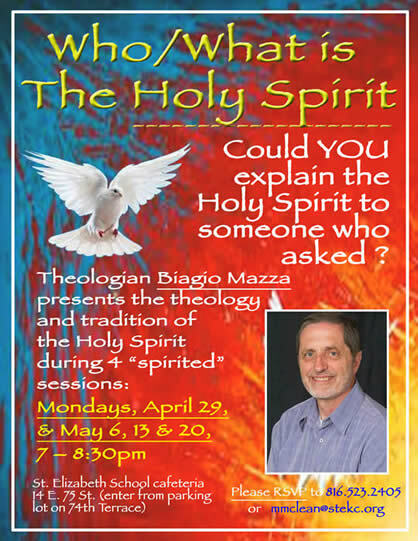 Join theologian Biagio Mazza as he leads us to a better understanding of the identity and role of the Spirit as articulated in Scripture, in our Christian tradition, and as experienced in our lives and in all of creation. To help estimate handouts, please RSVP to Dcn. Mike at mmclean@stekc.org, or 816-523-2405. Bring a friend—and a snack to share. Below is a list of candidates that are running for the St. Elizabeth 2019/2020 School Board. Click here to read the canididates' bios. There are three open positions, one of which will be filled by a parishioner without children enrolled in the school. Elections will be held Friday April 26th through Sunday April 28th. All adult members of the parish and St. Elizabeth School may vote. Voting will occur before school and after school on Friday, April 26th, and after all masses Saturday, April 27th and Sunday, April 28th. If you have any questions, please contact the School Board President, Joe Coyle at jcoyle@pyramidns.com. Why: To help support the St. Elizabeth Knights charities. 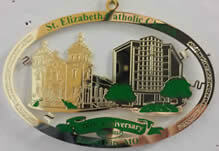 A portion of the proceeds will go toward the St. Elizabeth Building Our Legacy Capital Campaign. Gather your table, sponsor a race, name a mouse! Our building partners are hard at work in the Church building and that requires the building to remain unoccupied. As Fr. Greg recently announced at Mass we will celebrate Holy Week and Easter in the Gym and all daily Masses in the Chapel of St. Romero in the PMC. Like the Israelites during many times of their history, we are living outside our preferred home, and we’re embracing this disruption in our Lenten theme (and beyond), Building Church. During this time of Building Church, we have to be more flexible with schedules and patterns, more aware of each other’s needs, and more kind and responsive when asked to help. - Entrance: Please enter the Gym using the entryway that faces 75 th Street and sits across the parking lot from the Hardware Store. - Exits: Leave the gym church thru the front door. 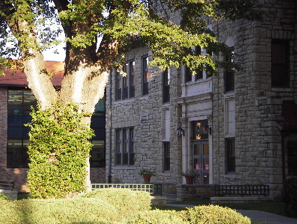 A side door is also available as an exit – it is on North side of gym. That exit is a set of metal stairs that lands in the driveway behind the gym. - Parking: Please leave the parking spaces between the Gym and the Hardware Store – as well as the parking spaces on 75 th Street – available for members of our assembly who have mobility challenges. - Accessibility: An accessible ramp is available on the West side (Hardware Store side) of the Gym building. -Tarp: Please watch your step if you have mobility challenges. And please watch out for folks who need more time and more space to maneuver on the tarp that covers the gym floor. -Awareness: Please maintain an atmosphere of reverence and quiet before, during, and after Liturgy. -Children: Parents and other family members, please help children to maintain a spirit of prayer and reverence before, during, and after Liturgies. -Hallway: Please be aware that sound carries very well from the Hallway into the worship space. Running and talking in the hallway will distract and detract from prayer. -Posture: It is appropriate to bow to the Altar as you enter your seat row. -Kneeling: At times in the Liturgy when we normally kneel, please stand. If standing is too uncomfortable or not physically possible, sitting is appropriate. Building Church asks each and all of us to trust each other a little more, to listen to each other a little better, to be a little more patient with unexpected changes of plan, and to practice our senses of humor and flexibility. Thank you for joining us on this adventure ! Join our dynamic stretching and strengthening classes for women. We will feature meditations to refresh the soul as we utilize physical exercise to promote core strength to build a solid foundation for the body! Classes for women meet every Monday night at 6pm in the school library. During construction access to library will be from the school doors facing 75th street. For more information, contact Mary Beth McClain at mbmcclain87@gmail.com. 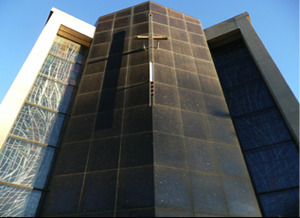 Please note that beginning Monday, February 25, daily Masses (7:00am and 11:30am) will be celebrated in the Parish Ministry Center’s (PMC) Chapel of St. Romero, across Main St. from the church, during renovations. 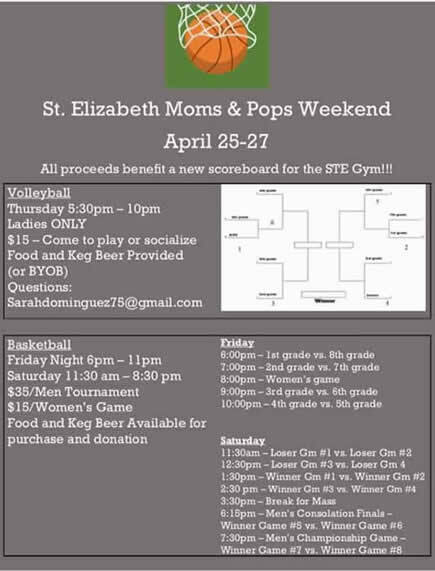 Weekend Masses beginning March 2 and 3 will be held in the St. Elizabeth School Gym. Please enter the gym through the main entrance on 75th St. Thank you for helping to Build Our Legacy! Renderings and other information can be found www.stelegacy.com. You can click here to submit your pledge online or there are also pledge cards in the pews. We would like every household in the parish to be part of this campaign. Click here to donate online via credit card or bank transfer. 8th grade students at St. Elizabeth School are developing and promoting service learning projects that require an action plan of advocacy and engagement. Students are developing social media and preparing for their service learning fair on Tuesday, May 7th from 1:30-3PM in Seton Hall. Part of their advocacy and action is to create opportunities for service to others. Students will serve at various chosen organizations or organize collections on behalf of their non-profits. This will include a needs-based drive for a domestic violence shelter, a book drive for a literacy group, a food drive for food banks, a toiletry drive for the marginalized, jeans' days supporting domestic violence and pajamas for children. Also planned is a lemonade and cookie sale for the Honor Flight, selling teacher wishes for a children's foundation, and a music camp for cancer. This is just the tip of the work students are putting together. The mission of the St. Elizabeth’s El Salvador Ministry is to promote solidarity and exchange between the St. Elizabeth Parish community and our sister communities in El Salvador, Romero Community and Palo Grande/Suchitoto. We have partnered with these community since 2013 to provide scholarships to the youth, and much more. In ninety percent of the homes in the Romero Community, a woman is the head of the household. Click here to view the “women run this community video” about the women of the Romero Community, their to fight for their land, homes and livelihood, and their drive to provide relevancy to women in a male-dominated society. Please help us continue our legacy of generosity and solidarity by clicking here to make a contribution to the St. Elizabeth El Salvador Scholarship Fund. Questions: please contact Kerm Fendler (913-488-7790 or kfendler47@gmail.com) or Carrie Madden (913-485-8361 or carriesmadden@gmail.com). St Elizabeth is sponsoring two mission trips to El Salvador in 2019 An adult trip in January and a youth trip later in the year. For more information contact Joel Jones by phone (816)509-6988 or jjinwaldo@gmail.com. Click here for information about the Youth Scholarship Program and to donate by mail. Click here to view the video from our 2016 trip. Know Someone Who Could Use a Caring Visitor? If you know of a homebound person who lives in our parish boundaries who would appreciate calls or weekly visits from a volunteer in our Caring Visitors ministry, please call the parish office at 816-523-2405. Your tithing gifts make it possible to provide and grow the ministries of our parish and fulfill the STE mission of "prayer and action, to further God's kingdom on earth", and we thank you for your ongoing generosity and commitment. Commitment cards can be returned via offertory, by mail, to the PMC or online by clicking here. Thank you for your generosity and stewardship. Habitat for Humanity’s KC House of Abraham brings together faith communities from the three Abrahamic traditions—Judaism, Christianity and Islam. The communities work together to raise funds and volunteer time building a home for a Kansas City family. NEW WORK DATES COMING SOON! On-site training is provided, and no experience is necessary. You will meet at the Habitat office at 1423 E Linwood Blvd. for a briefing before heading to the job site. You must be 16 with a parent, or 18 years old to volunteer. spread inclusion through FIRE! Thank you to everyone who participated in purchasing raffle tickets. FIRE was founded in 1996 by a group of parents who shared a common dream; for their children with special needs to attend their parish schools with siblings and friends. Since that time, through the efforts of parents, a dedicated board of directors, many talented volunteers and community members who embrace inclusive Catholic education. The FIRE Foundation, an independent 501(c)3 organization, makes it possible for partner Catholic schools to hire special educators and paraprofessionals and to acquire learning materials and technology that create successful learning experiences for all children. Without grants from FIRE, most schools would not be able to welcome students with Down syndrome, significant learning disabilities, many who are on the Autism spectrum and students who face other special learning challenges. In inclusive learning environments, children grow up knowing and appreciating each other’s unique gifts. St. Elizabeth is a proud partner school. Relive and enjoy the beautiful music from our Centennial Concert on November 9th, 2017 with your very own CD recording, “Sounds of St. Elizabeth”. All the solos, choirs, guitar band, bell choir songs and more are included in this special keepsake CD. CDs will be available for purchase for only $10, after Masses and in the parish office. On September 9, 2017 we celebrated the first 100 years of our parish with Mass and the Taste of St. Elizabeth. We were blessed to have to parishioners, Doug Kinney and Daniel McBride volunteer as photographers to capture many of the moments and faces of the day. Click here is view the online album of their photos. St. Elizabeth Parish does not share parishioner information with any outside business or organization. St. Elizabeth Parish does not endorse political candidates, nor does the parish allow any official campaign activity regarding individual candidates to take place in the name of the parish or on parish property. Everyone has a different story about why they are called to be a Christian steward... click on the links below to read a few from our parishioners. "That does not sound like you." "It's just what we do for family." "It started with a valentine." "God is the main Head Coach." "Experience that awesome feeling that comes with being part of something bigger than ourselves"
"It is not an obligation to us. It is a privilege." "How shall we make a return to the Lord for all the good He has done for us?" "God prepared this house for us." "A Volleyball Match, a Pocket Knife and a T-shirt." thought-provoking perspective on stewardship. Enjoy!